Hello everybody! Toni here to share a project I've made for one of my crafty friends. I suppose I'm like many craft bloggers, in that I love visiting other peoples blogs and seeing the amazing things people craft from a few simple ingredients. I never cease to be amazed at the generosity of these bloggers who share their work, along with detailed tutorials. One such blog I found some time ago, is called 'Todolwen Old and new' You can follow the link to her blog here. This very talented lady makes the most amazing things using vintage ephemera, lace, wire and all manner of luscious goodies. 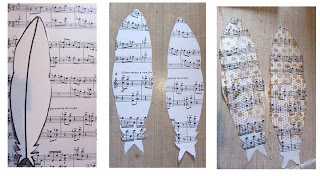 One of my favourite tutorials of hers, is on how to make a wonderful feather from a piece of sheet music. 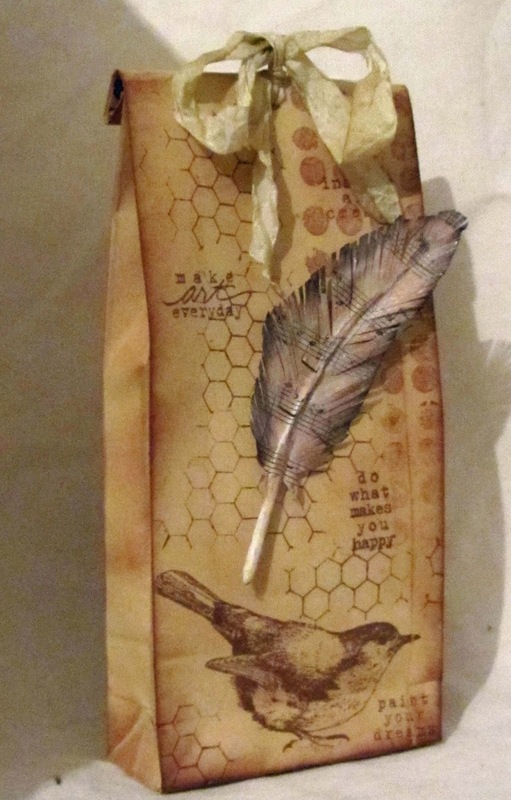 I made a few of these a while back and had always intended to revisit the idea, so here is my latest interpretation, adorning a gift bag I've decorated for a friend's birthday. 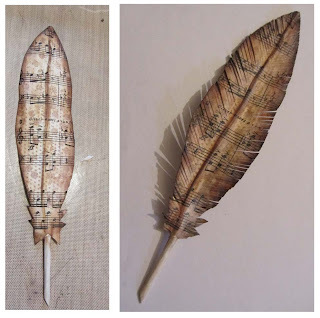 I've taken the following pics showing process for making a feather like this one. The first picture shows the template I drew and a photo copied sheet of music. I cut out two pieces to form the front and back. The third picture, shows the stamping I did on top using Tim Holtz Mixed Media Stamp Set and Vintage Photo Distress ink. I made the 'spine' of the feather with a piece of 20 guage wire bent in half. I wrapped the bottom ends with a sticky label, and then secured it to one half of the feather with Glossy Accents. More Glossy accents was spread across the feather before adhering the top piece. Once dry, I did a bit of painting with Antique Linen Distress paint and inking with Gathered Twigs, Vintage photo and even a little Black soot around the edges. 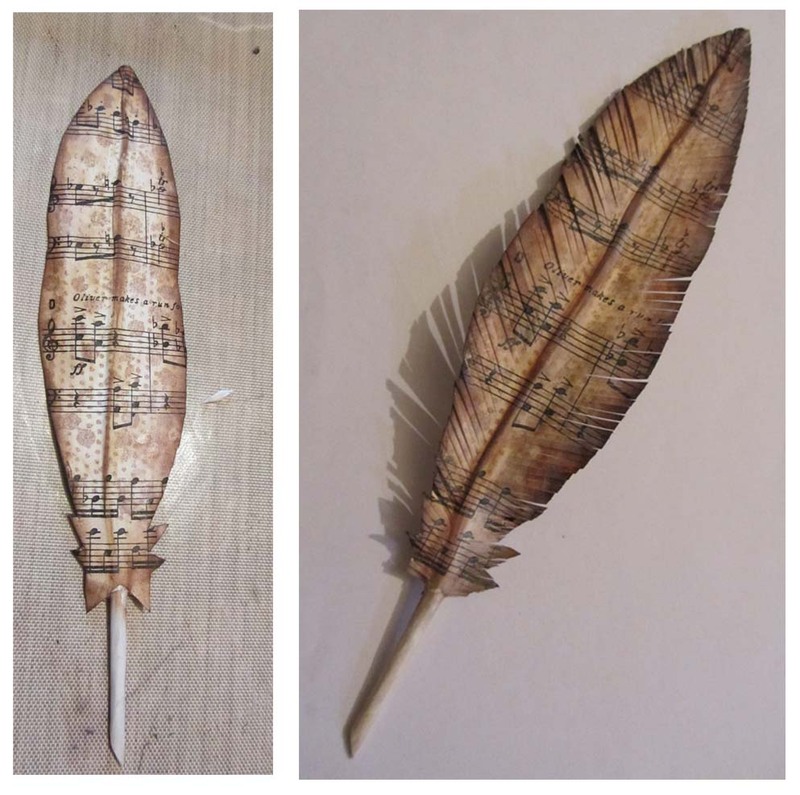 After more drying, I proceeded to cut into the feather working along one side and then the other, snipping all the way along the edges at an angle, keeping the cuts quite close together, this is a bit scary but you kind of develop a rhythm. I then gave it a little spritz of Perfect Pearls Heirloom gold Spray. 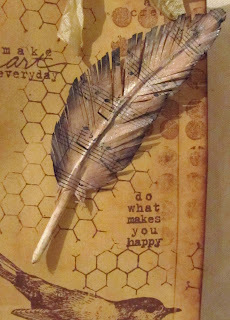 Here's a closeup of the feather I used on my gift bag. It's slightly smaller than the previous one. 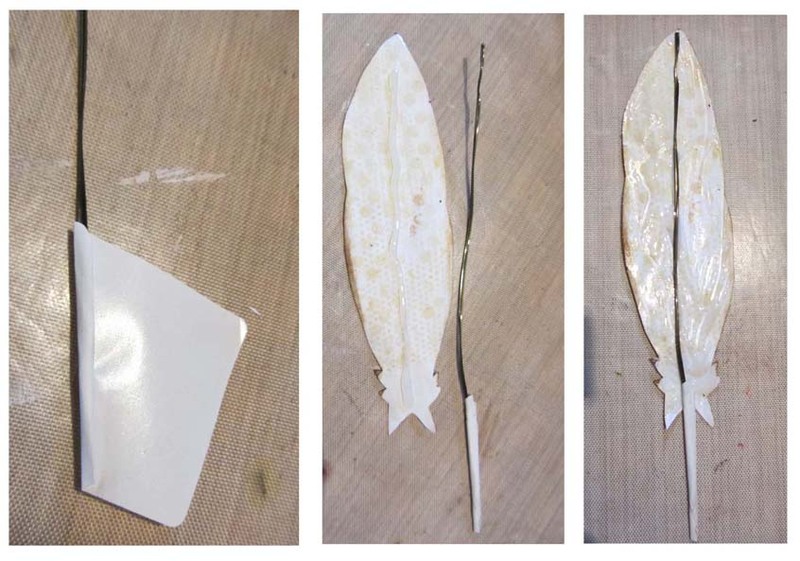 Of course I never thought to measure the proportions before launching into making the feather and my first one was too big for the bag, so this is actually mark 2. I used the same Tim Holtz background stamps and added these little phrases from Donna Downeys Art and Possibility stamp,s from Unity Stamp Company. The little bird is an old stamp from my collection. 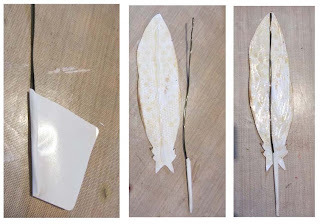 This last picture is of all the feathers I've made so far.These have been sprayed with Duylusions inks and Perfect Pearls sprays, obviously they're from some rare and exotic bird ! These links will take you straight to some of the products I've used in this project, available from the eP shop. Wow, love your feathers, will have to try that! Beautifull. Wow, that's amazing, Toni! These are beautiful...need to give this a try sometime!! Wow, Toni - this is stunning. 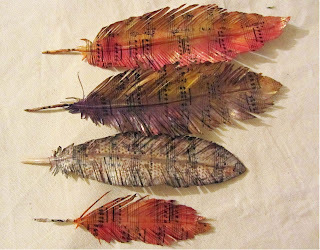 I love the paper bag stamping in any case, and then those feathers - wow! Awesome, Toni. LOVE your feathers! What a gorgeous project. Love the feathers! Beautiful feathers, Toni! Thanks for the step by step! Love your project!!! Stunning Toni and woohoo thank you for the step by step, looove it!! that is awesome. looks just like a real feather. I love it. Love your gift bag Toni and your feathers are gorgeous. I've been following Todolwen for some time now, her work is amazing.